Spinach crops require weed control from nearly the moment a gardener decides to plant them, extending throughout the growing season. The University of Florida IFAS Extension notes a distinct loss of spinach crop yield if weeds are allowed to run rampant. The University of California Integrated Pest Management program recommends a broad approach that encompasses several means of weed control. Weed control in spinach helps prevent weeds from choking out spinach plants and cheating them out of nutrients, sunlight, and water. 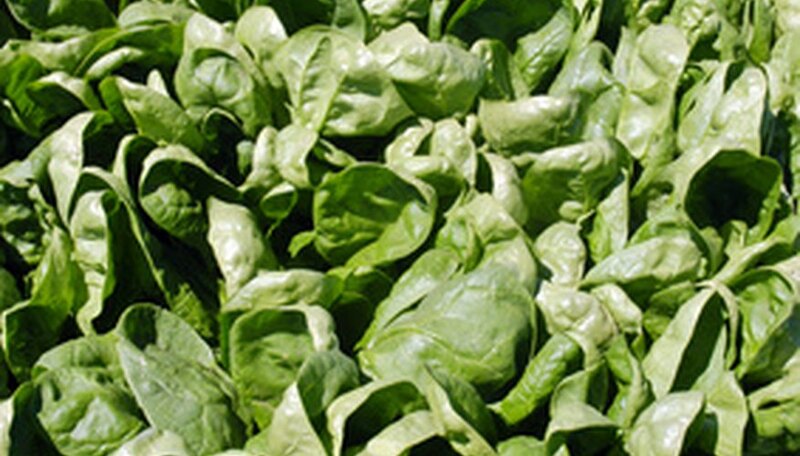 Good weed control practices allow spinach to grow healthfully and vigorously to maturity. Strong, healthy spinach is better able to protect itself against diseases, insects, and drought conditions. Additionally, strong, healthy spinach may contain more vitamins and nutrients than weak spinach, according to food writer Michael Pollan, although he also notes that evidence is inconclusive at this point. According to the University of California Integrated Pest Management program, spinach weed control is comprised of both chemical (herbicidal) and cultural methods. Both these methods should be used in conjunction to control weeds in spinach successfully. Crop rotation involves planting different crops in the same spot from year to year in order to prevent a buildup of the same weeds and insect pests. Solarization involves allowing soil to remain fallow (unplanted) for a growing season and covering it with black plastic to amplify the heat of the sun. This heat can kill weed seeds, as well as some harmful insect pests. Preparing the ground by adequately breaking up large chunks of soil can aid in more even and effective dispersal of herbicides, which provide chemical control of weeds. Fumigants treat weed seeds prior to their growth, while other herbicides treat weed seeds as they germinate (preplant incorporated herbicides) or after they have been established (preplant foliar herbicides). Spinach weed control starts before the spinach is planted, with some of the cultural methods defined above. It continues throughout the life cycle of the spinach plant, with application of herbicides at different periods depending on application instructions. Fumigation herbicides are generally applied prior to seed planting, to kill any weed seeds that may have made their way into the planting bed. Preplant incorporated and foliar herbicides are both applied after spinach seeds have been planted, though application times and rates differ by specific herbicide. Small home spinach beds can also incorporate hand weeding to offset what other weed control measures miss. With large commercial spinach growing operations, this method is expensive and time-consuming to maintain, and is usually not pursued for those reasons. Spinach grown closely together can help to shade out weed growth but may not be entirely effective on its own. Unfortunately, the University of California Integrated Pest Management program notes that there are currently no known insects or other biological methods of controlling weed problems in spinach crops. Cultivation can also help to improve spinach health and decrease the chance for weeds to take hold over the course of a season. The University of Florida IFAS Extension recommends mulching spinach crops to help keep weeds at bay. Not all herbicides are labeled as safe for spinach use. Similarly, not all herbicides treat all weed problems. New England Vegetable Management has a list of active ingredients in spinach-specific herbicides, as well as the common brand names in which these active ingredients can be found. Gardeners planting spinach should try to identify which weeds are a problem in their area in order to accurately target them. Local cooperative extension offices throughout the U.S. should be able to provide information on exactly which weeds are known to be a problem in the area.